A 23' x 4' 6" clench built rowing gig, fitted with a 4 cylinder 3 1/2 bore x 4 3/4" stroke engine from a Kelvin Car developing 14hp @ 900rpm and driving a 16" diameter 18" pitch three bladed propeller. Achieving a speed of 10.43 knots over the measured mile at Skelmorlie on the Firth of Clyde. The reversing gear is within the engine's flywheel with Simms-Bosch low tension ignition. The engine cooling system is fresh water with the heat exchanger pipes running alongside the keel. The silencer is mounted within the funnel, which also acts as the ventilator for the engine's casing. 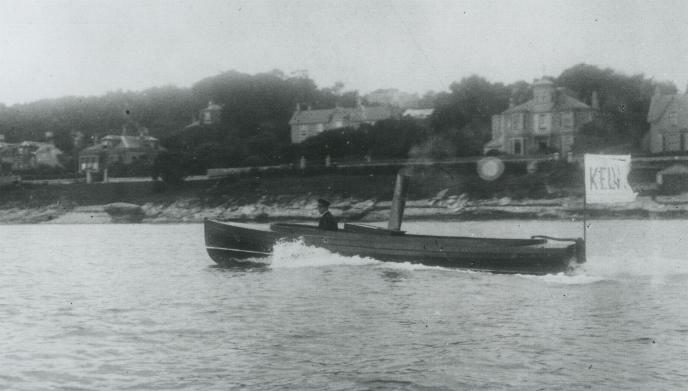 The boat started life as a rowing boat carried on the davits of the 168 ton yacht Torfrida, built in 1881 by J. Elder & Co. of Glasgow for R. S. Allan, a ship owner and director of Cunards. This launch is the one refered to by Mr. D. W. Willocks in his Jubilee Speech as chairman of the Bergius Company in 1954. This boat has the first marine Kelvin Engine. Mr William Bergius is at the wheel. This photograph was taken at Kirn, with Jim Crow rock on shore just ahead of the boat.